Peterborough Northern Star picked up a comfortable three points when entertaining Boston Town in the ChromaSport & Trophies United Counties League Premier Division last night (November 16). They won 3-0 thanks to goals by Sam Wilson (2) and James Hill-Seekings. There was also a win for Holbeach United, who had Matt Warfield, Ollie Pinner and Jordan Thomas to thank for a 3-1 victory at Huntingdon. 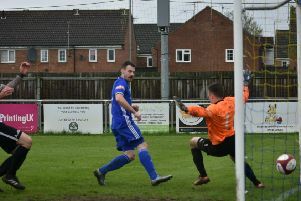 In the Lincs Senior Trophy game at Outgang Road, Deeping Rangers advanced to the semi-finals by overcoming Division One side Blackstones 3-1 with goals by Dan Schiavi (2) and Jonny Clay. Player boss Phil Gadsby scored the Stones consolation effot.